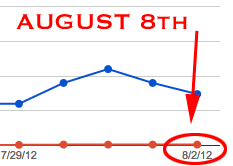 Typically, Google updates the reports within Google Webmaster Tools daily but it typically is two days behind. Right now, the reports have not been updated since August 2nd, which puts us currently six days behind schedule. Google has had delays before with Google Webmaster Tools, so this is not new. Google's Gary Illyes from the Zurich, Switzerland office responded that Google will be looking into it. Thanks for posting! I let the engineers know and they're going to take a look. So if your reporting is delayed, do not panic, it is everyone.